Our SMS messaging service lets you send and receive SMS online. You can deliver SMS alerts, notifications and marketing messages to your target audience at a competitive cost to generate leads, sales and more. Voodoo SMS is an online SMS messaging service built for developers and marketers. Using our simple but powerful platform, you can deliver your SMS message to your entire marketing list of prospects, customers and users in the UK. With our dynamic SMS support and detailed delivery reports, you’ll be able to edit and optimise your SMS message for the best possible response rate, helping your business generate sales, improve customer retention and increase revenue using SMS. How does our SMS messaging service work? Voodoo SMS is a user friendly, powerful online SMS messaging platform built with the needs of marketers and developers in mind. Using Voodoo SMS, you can import your marketing contact list and reach them using SMS. Text messages have the highest open rates of any direct marketing channel, making SMS a fantastic tool for your business to keep in touch with its prospects and customers. 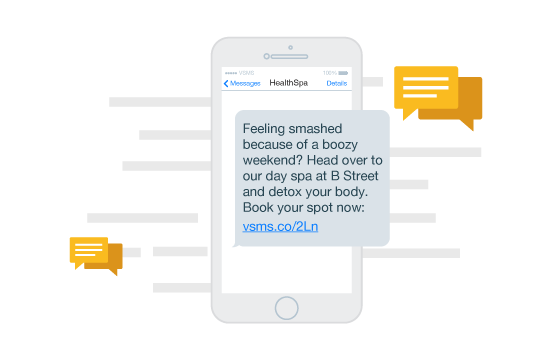 Starting your first SMS messaging campaign with Voodoo SMS is simple. Just create your free account and import your contact list. From here, you can write your first SMS and schedule it to deliver immediately, at a later time and date or in batches every hour, day or week. Our SMS messaging platform uses a volume-based pricing system. You can fund your account for as little as one message, or purchase one million message credits at once. You'll pay less for each credit the more you buy, down to as low as 1.74p per credit. Our SMS messaging service supports dynamic SMS. These are SMS messages customised to include information like the recipient's name. Dynamic SMS has a far higher response rate than standard SMS, making it a great tool for reaching and engaging your target audience. You can customise your messages with promotional discount codes, encouraging your audience to take action and claim your offer. Our detailed and accurate delivery reports let you stay on top of your campaign’s performance and monitor how many people respond to your SMS broadcast. Use our shortcode number or your Virtual Mobile Number (VMN) in your message, or add a trackable link to your SMS message to monitor clicks to your website. Our SMS platform is designed with the needs of marketers in mind, making it easy for you to assess your campaign’s performance. Using our SMS messaging API, you can integrate Voodoo SMS with your app, website or CRM software to deliver targeted, personalised messages to your customers, clients and users. Our SMS messaging API can integrate with your mobile app using just a few short, simple lines of code. We even offer integration modules for ecommerce systems like Magento and OpenCart to make integrating Voodoo SMS with your website as simple as possible. Using our SMS platform, you can deliver marketing broadcasts, targeted notifications, delivery and appointment alerts, special offers and more to your audience via SMS. Voodoo SMS is the UK’s top SMS messaging service provider. Create your free Voodoo SMS account now to import your contact list, write your text message and start your SMS marketing campaign.